Several times JP Morgan Chase has commented about Bitcoin and cryptocurrencies. It has also given its opinion about blockchain technology and their uses. The most important cryptocurrency on earth may be revolutionizing the financial world. According to JP Morgan, Bitcoin is a revolutionary currency. 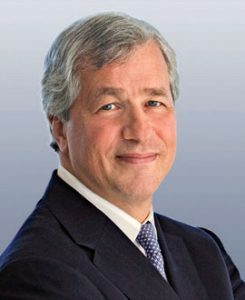 JP Morgan CEO, Jamie Dimon, has always criticized Bitcoin and other cryptocurrencies. He has threatened its own employees saying that if he would know that one of them is trading Bitcoin, he would immediately fire him. Maybe, his aggressiveness towards cryptocurrencies and his critics are just one of them any ways to show fear. According to Mike Novogratz, Jamie Dimon attacks Bitcoin because it is a threat to the bank he runs. According to the annual report that has released on February the 27th, Ethereum and Bitcoin are risk factors for JP Morgan. One of the most important points of cryptocurrencies is that they allow individuals and enterprises to freely transact money without a third party involved in the transaction. There is no need to trust another third party in the transaction in order to send or receive payments, something that banks currently do. The most important banks are working with blockchain technology in order to improve their products and services. For example, JP Morgan is working to tackle the new challenging environment all over the world. Since a very long time that the bank is working with blockchain technology, reducing the cost of transactions and the processing times for transnational payments. Bank of America is another important bank that believes that cryptocurrencies are revolutionizing the banking industry. According to this important bank, the adoption of new technologies like Bitcoin and blockchain, will require the bank to heavily invest so as to upgrade the existing products and services. No matter if Jamie Dimon believes that Bitcoin is a fraud or not, the reality shows that cryptocurrencies are here to stay and they pose a serious threat to traditional financial institutions.